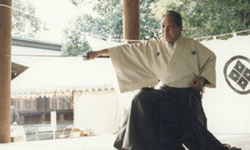 Seishinkan Iaido teaches the traditional koryu martial art of Musou Jikiden Eishinryu Iaido as taught by the late Yasuyoshi Kimura Kancho (10th Dan Hanshi “Grandmaster”) at his dojo Meishinkan in Osaka, Japan. The head of Seishinkan Iaido is Glenn Stockwell Kancho (7th Dan) who trained directly under Yasuyoshi Kimura Kancho in Osaka since 1991. Seishinkan Iaido currently has eight dojos in Japan, Australia and the United States of America. Seishinkan Iaido is recognised as an official shibu (regional branch) of the Dai Nippon Iaido Renmei (All Japan Iaido Federation) and is the only non-Japanese dojo recognised by the Renmei in this way. The annual All Japan Iaido Federation Taikai (Championship) is held at the site of the Iwashimizu Hachimangu Shrine in Yawata-shi near Kyoto, Japan on 3 and 4 May. Members of Seishinkan Iaido attend and successfully compete in the Taikai every year since 1999. A record of Seishinkan members' achievements at the Taikai can be found on the Achievements page. Held biannually, the Australian National Iaido Seminar is a two day training seminar bringing together members of the various Seishinkan Iaido dojos in one location. The National Iaido Seminar involves a taikai (championship) and a grading for Seishinkan Iaido members up to the rank of godan (fifth degree black belt). A record of Seishinkan members' achievements at the Australian National Iaido Taikai can be found on the Achievements page. The location and date of the next Australian National Iaido Seminar: To Be Advised. Dojo Tours are day-long seminars held at Seishinkan Iaido's Australian dojos at various times throughout the year. Seishinkan Iaido Instructors attend each Dojo Tour to provide students the opportunity to workshop, exchange ideas with and learn from different teachers. Photographs of Dojo Tours available in Dojo Tour Gallery. ​In recognition of the 25th Anniversary of Seishinkan Iaido in 2018, celebrations to honour this special achievement featured additional training sessions across Seishinkan Iaido Dojo, and an Anniversary training Seminar in Melbourne, Victoria.